As we planned the landscaping for our new home, a friend gave us some cannas to plant. These tall colorful flowers did well in the soil around our house, and we enjoyed their beauty all summer and fall. Cannas are tropical flowers, so I did as instructed and dug up the tubers last fall and stored them in the basement over the winter. When spring arrived, I planted them again. Not only did I plant a patch near one corner of the house, like we did last year, I also planted some along another side of the house and another line of them along one end of the house. (As I said, I really like cannas!). 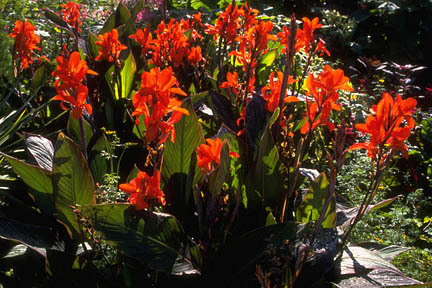 Once again, the patch of cannas that I planted grouped together did extremely well. However, the ones I planted in a line alongside the house did not fare so well. I have a theory that they do better when they grow together in bunches. So it is with Christians. We grow better together. The New Testament is filled with “one another” verses to remind us that we can’t become all that God wants us to be if we try to do it alone. We need to grow together to reach our full potential. “From him the whole body, joined and held together by every supporting ligament, grows and builds itself up in love, as each part does its work.”—Ephesians 4:16. This entry was posted in Christian Living and tagged cannas, Ephesians 4:16, Fellowship, flowers, illustration, landscaping, togetherness, unity, working together. Bookmark the permalink.